The theatrical and extended television versions of Ingmar Bergman's powerful drama is planned for Blu-ray in November. In an early announcement to retailers, the Criterion Collection is working on 'Fanny and Alexander Box Set' for Blu-ray on November 8. Ingmar Bergman intended Fanny and Alexander as his swan song, and it is the legendary director’s warmest and most autobiographical film, a four-time Academy Award–winning triumph that combines his trademark melancholy and emotional intensity with immense joy and sensuality. 'Fanny and Alexander - The Theatrical Version' - Through the eyes of ten-year-old Alexander (Bertil Guve), we witness the great delights and conflicts of the Ekdahl family, a sprawling, convivial bourgeois clan in turn-of-the-century Sweden, in Ingmar Bergman’s intended swan song, Fanny and Alexander. 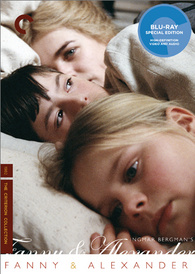 'Fanny and Alexander - The Television Version' - Ingmar Bergman has described Fanny and Alexander as “the sum total of my life as a filmmaker.” And in this, the full-length (312-minute) version of his triumphant valediction, his vision is expressed at its fullest. 'The Making of Fanny and Alexander' - Directed by Ingmar Bergman himself, this feature-length documentary chronicles the methods of one of cinema’s true luminaries as he labors to realize his crowning production. The Blu-ray will feature a new 1080p digital transfer, monaural soundtracks, and supplements include: Ingmar Bergman Bids Farewell to Film, a sixty-minute conversation between Bergman and film critic Nils Petter Sundgren recorded for Swedish television in 1984; Audio commentary on the theatrical version by film scholar Peter Cowie; A Bergman Tapestry, a documentary featuring interviews with cast and crew; Costume sketches and footage of the models for the film’s sets; Stills gallery; Theatrical trailer; Optional English-dubbed soundtrack for the theatrical version; and a booklet featuring essays by documentarian and film historian Stig Björkman, novelist Rick Moody, and film scholar Paul Arthur. Suggested list price for the Blu-ray box set is $59.95. You can find the latest specs for 'Fanny and Alexander Box Set' linked from our Blu-ray Release Schedule, where it's indexed under November 8.